Discover more of beautiful Tropical North Queensland with sightseeing activities in the Great Barrier Reef & the Daintree before travelling down the coast aboard the Spirit of Queensland. 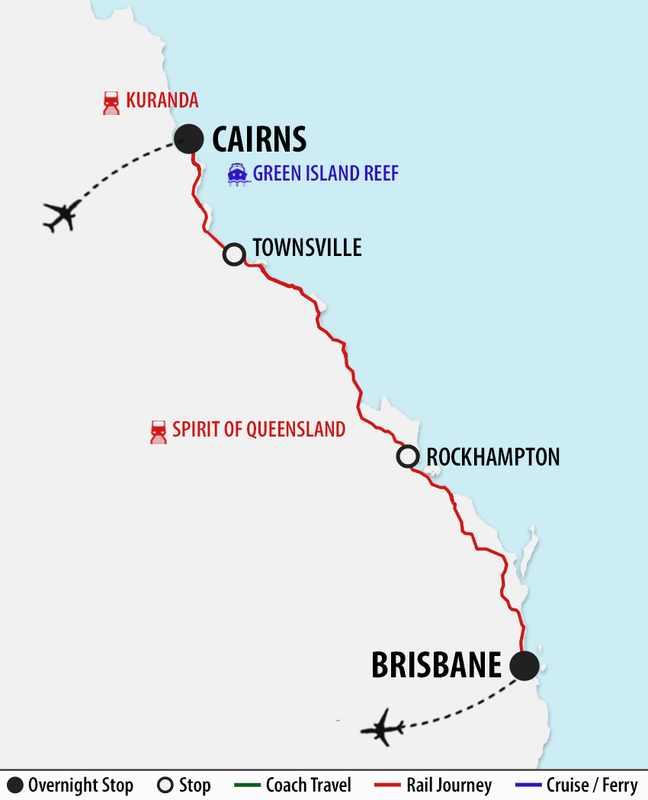 Your journey begins with a flight to Cairns in Tropical North Queensland. On arrival, you will be met and transferred to the Pacific International Hotel where you will be staying for the next 5 nights. Tonight, enjoy a fabulous dinner in the hotels spectacular Bushfire restaurant with views over the esplanade. The menu includes prime Australian beef cooked over volcanic rock served with fresh garden salads or fresh local fish of the day. Dinner also includes desserts, tea and coffee. You will be met at your hotel after breakfast this morning and transferred to the Kuranda Train. This train trip gives you one of the world’s most breathtaking train rides, travelling through hand hewn tunnels and across bridges whilst enjoying spectacular views along the way. Stop at Barron Falls to watch the amazing waterfalls before arriving at the picturesque Kuranda Railway Station. Here, you will have time to explore the popular Heritage markets or visit the Butterfly Sanctuary or the Kuranda Koala Gardens. Later, board the Skyrail on a journey into the world’s most beautiful rainforest as you guide over the canopy. A coach will be waiting for you on arrival at Caravonica Lakes to transfer you back to your hotel. This morning, you will be picked up from our hotel and transferred to the wharf to board our cruise to Green Island. 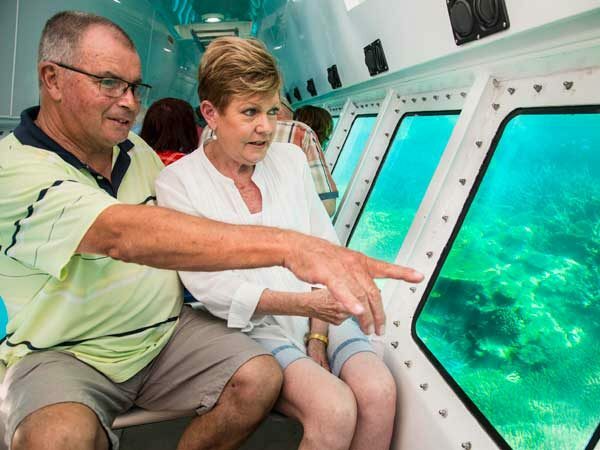 A choice of activities are available today, including a cruise in the special glass bottom boat which allows passengers to see the brilliantly coloured fish and coral without getting wet! You are also able to join a semi submarine cruise allowing you an up-close experience to the marine life and Barrier Reef Coral. This tour also includes a magnificent buffet lunch served on the Big Cat cruise. Other activities on offer today include safe snorkelling or you can just laze on the island beach. Return to your hotel at about 5pm. After breakfast, you will be treated to an escape into World Heritage Rainforest. The Daintree and Cape Tribulation National Park is one of the most significant in the world. Cruise into the Daintree and enjoy a BBQ lunch in a beautiful rainforest setting. Take a stroll along the boardwalk and beach at Cape Tribulation, ‘Where the Rainforest Meets the Reef’. Afternoon refreshments are provided before being returned back to your hotel. Join a half day tour to Hartley’s Crocodile Adventure Park. Located just 40km north of Cairns, this is the best place to see crocodiles in Tropical North Queensland. Enjoy a unique eco experience on the lagoon cruise through the ecologically significant Melaleuca wetlands which are the domain of the saltwater crocodile. Explore the rest of the park with its abundance of wildlife, including water birds, turtles, wallabies and cassowaries. Marvel at the notorious head shake and death roll of the crocodiles during the Crocodile Attack Show! There is also an opportunity to hold a crocodile for a photo (if you’re game!). Discover the world’s most venomous snakes at the snake show before returning to the Pacific International Hotel. The rest of this afternoon is at your leisure before enjoying for a farewell dinner in the Bushfire Restaurant. 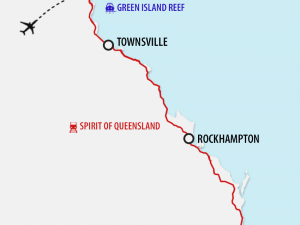 After breakfast, you will be transferred to Cairns Railway Station to board the Spirit of Queensland train. Relax onboard as the coastline unfolds while you travel south. You’ll take advantage of the benefits of the revolutionary RailBed service which provides you with a comfortable seat by day which includes your personal entertainment systems and converts into flatbeds at nights. All bed linen, sheets, pillows and towels are provided and a personal amenities pack. A licensed Club Car provides light refreshments, confectionary and beverages and is open 24 hours. Showers and toilets are located at the end of every carriage. Enjoy the culinary delights prepared using the freshest of Queensland produce – all meals are included and served directly to your seat. Breakfast is served as you continue your rail journey through Nambour before arriving in Brisbane. A transfer will meet you on arrival to take you to your hotel in Surfers Paradise on Queensland’s iconic Gold Coast. This evening, travel by coach to the New Australian Outback Spectacular and saddle up for a remarkable journey as one of Australia’s most stirring true stories is reborn. The show commemorates the Centenary of the ANZACS and the heroes of the legendary Australian Light Horse. Experience a deeper journey to the heart and soul of the High Country and be dazzled like never before by amazing animal stars, death defying stunts and stunning aerial performances. Hear the brave tales of May Wirth and Red Dog all accompanied by a stirring musical score composed especially for the show, as well as popular country music composed and written by country music legend, Lee Kernaghan. The larrikin sense of humour and competitive spirit that Australians are famous for encompasses the show and guests are encouraged to get involved as the stockmen and women from rival stations test their mateship and go head to head in some true blue Aussie challenges. Indulge in a 3-course gourmet Aussie feast with beer, wine or soft drink. With more drama, action, humour and excitement than ever before, Australia’s favourite dinner and show is more than a night out – it’s an experience steeped in courage, tradition and daring Australian spirit. Sadly, today marks the end of your guided holiday. A transfer will take you from your hotel to Gold Coast Airport in time for your flight home. Flights are included from all departure cities shown as required. These are based on Jetstar airfares from Adelaide & Perth, and Virgin Australia ‘Q’ Class Economy airfares from all other cities, and are subject to availability at the time of your booking confirmation.